Over the past year and a half, the Oregon Department of Transportation and the Federal Highway Administration, in partnership with the City of Portland, have been conducting an environmental study, also known as an Environmental Assessment, for the I-5 Rose Quarter Improvement Project. The Environmental Assessment was published on February 15, 2019 and is now available for public review and comment. Learn more about the environmental process (PDF). Review the Project's Environmental Assessment. Review the Project's Environmental Assessment online. Find a printed copy of the Environmental Assessment. There are four accessible parking spaces in the reserved Annex lot located on the north side of N Weidler St between N Vancouver Ave and N Williams Ave. The Leftbank Annex is easily accessible by bus and MAX, and is one block from the first stop on the east side of the Portland Streetcar line. The area is a major bicycle corridor and is easily accessible from every direction. How else can I review the study and provide feedback? 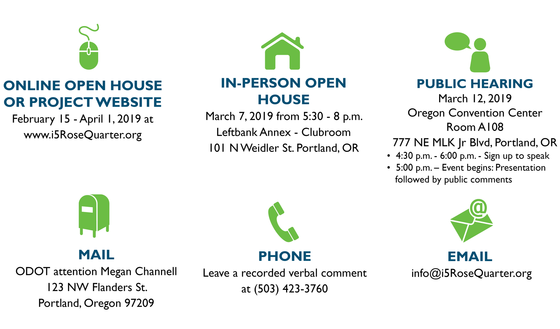 There are many ways to provide your input during the comment period that runs from February 15 - April 1, 2019 at 5 p.m. The I-5 Rose Quarter Improvement Project was created by ODOT in partnership with the City of Portland and with input from the local community. It will improve both local streets and I-5 in the Rose Quarter area resulting in a more safe and connected community that will keep people moving, whether you walk, bike, roll, drive, take transit, use local streets or the highway.